At Berrington, you’ll find that our owners, Glen and Karen, and the rest of their first-rate team have thought of everything. The greatest compliment we receive is when a resident has been out all day, having a wonderful time with family and friends, and looks forward to returning home; and home is Berrington. Just like any other home, how you choose to spend your day, inside or outside of our premises, is completely your decision. There are clubs, events and outings aplenty to choose from seven days a week. You can join your Berrington family or meet your son, daughter, grandchildren or a friend for a day spent outside our grounds. When you’re ready to return, you can have a rest in your comfortable quarters, delight in a three-course meal of your choosing or get good night’s sleep. There are always clubs to participate in, conversations to strike up, walks to take inside and outside, and much more, if you would prefer to stay within the Berrington grounds. Our enthusiastic team coordinates many different activities for you to select each day. Even on the weekends, we have much to offer. Amongst your options are bus trips to cinemas, shops or restaurants, gardens and other local attractions. 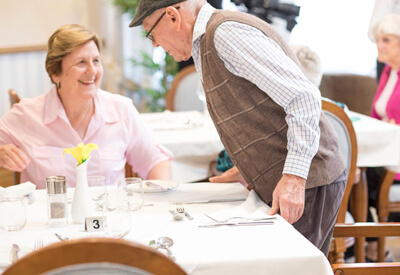 To understand what our residents desire, we consult with them to develop our events and outings, ensuring their every want and need is met at all times.